Like most kids, I had a electronics kit that taught the absolute basics; you could build something about as advanced as a radio or morse code device. Suffice to say, the fun didn’t last long once you’d built all 5 projects. Nowadays though, advanced electronics hardware kits are affordable and the possibilities are infinite – all thanks to the wonder of microcontrollers. Microcontrollers are basically primitive computers – hardware hacking has never been better, thanks to them, as it allows you to program complicated electronic circuits into simple, embeddable software. These platforms are established, developed, with thriving communities built around them. Really, right now is an amazing time to be alive if you have the faintest interest in electronics. Let’s take a look at 5 of the most popular kits around. The original Arduino was the brainchild of some Italian students, tired of expensive and fragmented development kits and lack of standardised software for programming them. They wanted to bring electronics hacking and microcontrollers to the world, and used an existing Open Source programming and development system called Wiring to realise that dream. The Arduino project itself remains fully Open Source, meaning you can download the plans for a board and build it with standard components; this has in fact led to a few Arduino clones that are slightly cheaper. Like most of the development boards featured here, it has a number of input and output connections, both digital and analog, enabling users to connect any kind of sensors and actuators (like motors) in an infinite range of devices; combined with customizable logic. The Arduino operates alone or in conjunction with a computer or other devices – it supports a range of communications protocols. You can also purchase specially shaped add-ons known as “shields”, which sit on top of the main Arduino board, duplicating pins and adding additional functionality, such as the Xbee wifi chip. I own an Arduino Uno myself, and have written a few tutorials First Steps With The Arduino: A Closer Look At The Circuit Board & The Structure Of A Program First Steps With The Arduino: A Closer Look At The Circuit Board & The Structure Of A Program Last time I left you having set up your Arduino to work with Mac or Windows, and having uploaded a simple test app that blinked the on-board LED. Today I’m going to explain the code... Read More here to get you started Arduino Programming for Beginners: Traffic Light Controller Project Tutorial Arduino Programming for Beginners: Traffic Light Controller Project Tutorial Building a traffic light with an Arduino is a great way to develop skills with basic coding and electronic components! Read More , as well as taking a look at an Arduino starter kit What’s Included In An Arduino Starter Kit? [MakeUseOf Explains] What’s Included In An Arduino Starter Kit? [MakeUseOf Explains] I have previously introduced the Arduino open-source hardware here on MakeUseOf, but you’re going need more than just the actual Arduino to build something out of it and actually get started. Arduino "starter kits" are... Read More that contains various electronic components as well as other essentials. At some point, I might even try tackling an LED cube like the one below, so keep an eye out for that. Designed specifically for wearable e-textile projects, the LilyPad is a tiny, flat circular version of Arduino – but fully compatible. Connections and pins are reduced, but otherwise core functionality is quite similar. If you’ve designed and tested your project on a regular Arduino and now want to move on to embedding into clothing, this is your best best. There are other versions of the Arduino available too, such as the Mega with a faster chip, more memory, and more I/O pins, but they’re principally the same – just smaller or bigger. If you’re looking at any of the Arduino models as primarily a learning device, I’d also strongly suggest you head over to Kickstarter and help fund the Modkit project, an innovative visual programming software so learners can ease into C++. At first glance, you’d be forgiven for mistaking the Netduino for an Arduino. Heavily inspired by the success of its Italian counterpart, the Netduino may be visually a clone, but internally it’s a different code platform. 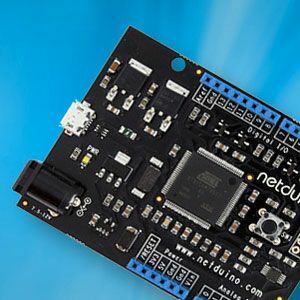 Built for the Microsoft’s Object Oriented .Net C# language and very Windows-centric, Netduino allows for higher level programming than is otherwise possible with the Arduino, where you’re essentially working with C++. Programming the Netduino requires Visual Studio and Windows, though there is experimental support for the open source C# project, Mono. Unfortunately, there’s not nearly as much support or community out there working with these things, so finding pre-made tutorials and projects is going to be difficult. Only consider if you really love C#, already know a good deal of electronics and just want to get stuck in with Visual Studio. Finally on our list, a step up from Arduino type microcontrollers, the Beagle Bone and Raspberry Pi are both embedded Linux devices, though the Raspberry Pi has gained most of the media attention for its seriously low $25 price point and rapid adoption into educational environments around the world. Both are capable of having complete Linux distros installed on them, and it’s even claimed that the Raspberry Pi can playback 1080P video (there’s even a Raspberry-specific version of XBMC Linux compiled). Both utilize SD-cards instead of bulky hard drives, and though the Beagle Bone is technically superior in processor terms, the Raspberry Pi has a far greater amount of projects and development going on for it. While the template-based coding of systems like the Arduino make it easy to copy-and-paste simple projects and a limited number of more complex libraries that don’t have a lot of interaction, 20 years of Linux development have generated an extensive set of highly interoperable software that can be utilized and collaborated upon, without sacrificing the simplicity of doing something like toggling an LED or switch or reading an analog or I2C-based sensor. I’d say that getting your first electronics project off the ground with these systems is going to be quite a lot harder than with an Arduino, but ultimately you’re going to have far more power and possibilities. Do you have a Raspberry Pi, a Beaglebone or any of the other devices listed here? Let us know in the comments about any awesome projects you’ve made. Are you think about getting one, and maybe we can help you decide? I think MSP430 Launchpad (http://www.ti.com/tool/msp-exp430g2) would be a good addition , although it is not easier as above mentioned ones , its $4.30 price tag would worth a try and it is also having a great community behind it. These look so cool, I wish I had 1 of these as a kid. Would you guys recommend this for a Beginner Computer Science College Student. I have a semester of Python under my belt and trying to touch it up over the summer and learn a few more languages. I was thinking of getting the Raspberry Pi, but I am open to suggestions. I believe Pi would be best for Python, but if you're looking for stricktly hardware/electronics hacking then go for Arduino; far more support and tutorials out there for it. You're pretty much on your own with a Pi, and you better have an intimate knowledge of linux.. I've been using linux since 09. I'm "okay" with it but I'd better choose the Arduino for support purposes just to be safe. If my budget permits I might also purchase the Pi as a side project for a challenge. Thanks! Some really cool stuff to do with my kids! Have you ever notice MK802 ? Nope. But its not a hardware kit either, just a mini PC.